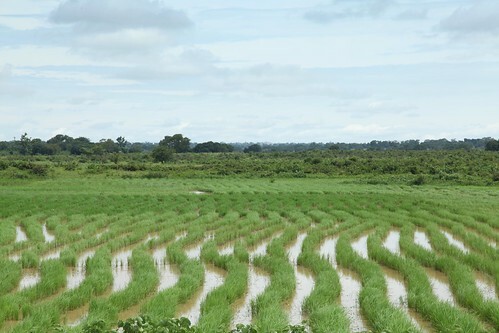 Rice paddy fields, Niger State, originally uploaded by nobodaddy69. I kept thinking I was in Thailand or China. In fact, the rice seed they use - Weta - has been introduced from India. Nice! why can't we do this in other parts of Nigeria, especially the riverine areas. There is a stretch like this too in Jigawa state and I felt exactly the same way when I visited. I Did not believe I was in Nigeria. The untold story here is how Northern Nigeria has become the food basket of Nigeria while the leadership in the South is busy enriching themselves and the people are busy looking for short cuts to wealth. Folks in the South no longer have the patience to engage in farming any longer. Even fertilizers stolen by civil servants in the South are sold to farmers in the north. Go figure.